Everything about this block makes me smile. From the color to the pretty white sashing bits to the name. 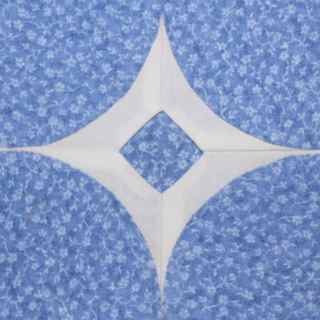 It is B5 and was prepared with reverse applique and traditionally piecing. I couldn't quite make the cross hatches line up perfectly even though I tried twice. I can't quite figure out what the name of this block has to do with anything. Does it look like a volleyball net to you? 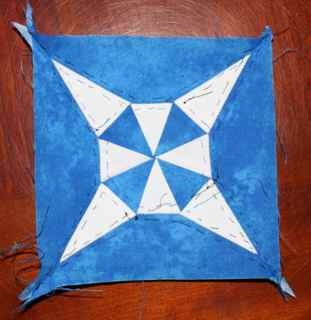 The center was applique and the four corners were paper pieced. I think it is a nice looking block. It is J3 and adds 17 pieces to my ever growing Dear Jane quilt. This one was traditionally pieced and should have been easy peasy. The first one turned out a quarter of an inch too big though. So I recut the squares at 1.5 inches instead of the little mark right after that on the ruler. It will float a little bit inside the outer square now, but I just didn't want to start cutting things to 1/16th of and inch. I guess this is why people use templates instead of trying to rotary cut everything. I'll add to jumbo 5.25 inch block to the orphan block bin. 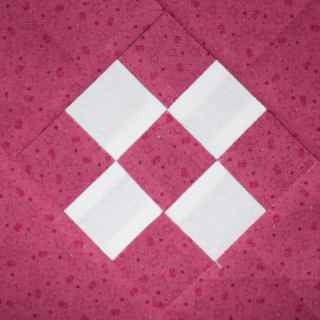 I6 was another simple applique block. It is handy to have them all prepped and ready to go. It adds 12 more pieces to the quilt in progress. Though it is a green Saturday, I won 't be checking in on everyone until Sunday when I get back from Disney World! I am lucky enough to be one of the coaches of the all-star academic team for our county and will be busy at the state competition this weekend. I will enjoy checking in with everyone when we get back. I couldn't go to Disney World without the kids after all. They are all pretty excited about missing a day of school. For now though, I do have some little green nine patches to share. They have been going through in between other blocks and are starting to add up. Use the linky below to share your own progress and to see what fabulous green projects other people have in the works. It was a jam packed day today. Because our team was not in the top two in our first match we had to play another qualifying game today. The family all headed out to Epcot while I did that. 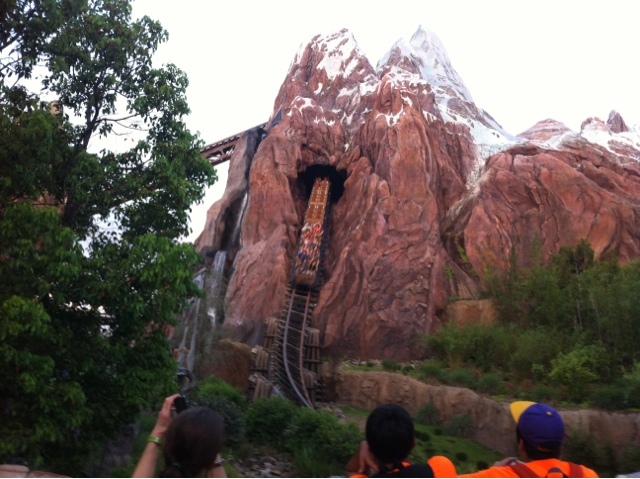 We qualified to play again tomorrow and then I headed off to Animal Kingdom with the family. As we headed over to the park on a shuttle bus it poured down rain. Through a great stroke of luck it stopped just as we got there but drove the crowds out of the park. We were able to walk on to every ride which meant the kids could ride their favorites again and again and again. We came back to our room to get cleaned up and then enjoyed the evening movie, fireworks and a light show on the river. What a day! 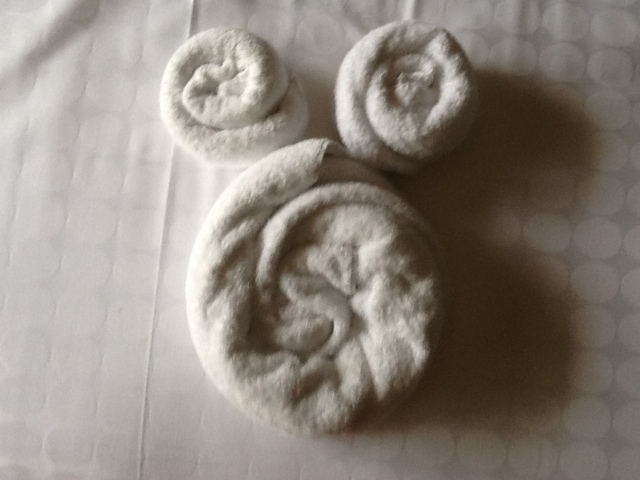 I feel a little guilty staying here at the Disney Contemporary Resort on a school day. We had our first match today and finished third. We were on fire in the first round but got beat to the buzzer consistently in the end. So we will play again tomorrow and then two more matches on Saturday. I have a three day park hopper pass so I might wander over to one of the parks and enjoy the sights while I wait for the family to head over. It has been one of those weeks. I haven't sewn a stitch since last weekend, but I thought I'd share this English Paper pieced block anyway. I stitched it together Sunday evening during a bit of family TV time. I enjoyed the process of hand piecing this little block though I'm sure my technique wasn't perfect by any quilt police definition. I used freezer paper templates from a printed copy of the block. which have fabric basted to them near the edges. Ryan and I just got back from the new student orientation night at my school. He will be a 7th grader next year. We have a lottery of students to get in, so it was fun to see which of the people we know got accepted. He signed up for Math Camp already which is a good chance for the new students to get to know one another before the school year starts. There is math too of course, but that isn't the part I'm concerned about. It seems like the year is already over with just 8 more days before the big end of course exam for Biology. I think there are 5 weeks left though, which isn't quite the home stretch. I've got ScrapHappy Saturday scheduled to post and I'll be sure to check in as soon as I get home again. 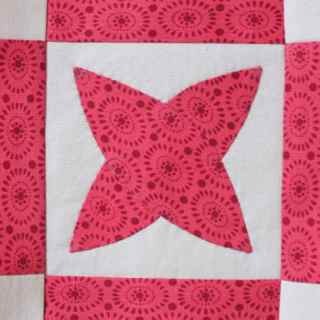 This one was simple applique on four squares. It is G1. TaDa. This one is J1. 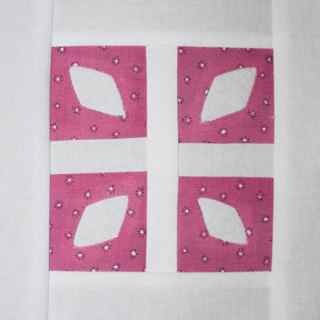 The diamonds were appliquéd before the four patch was sewn together. 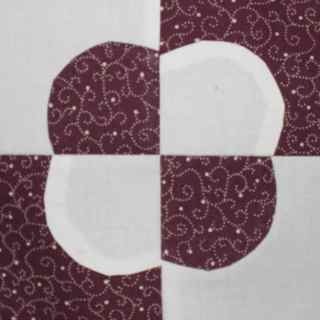 Then the center section was added underneath with reverse applique. 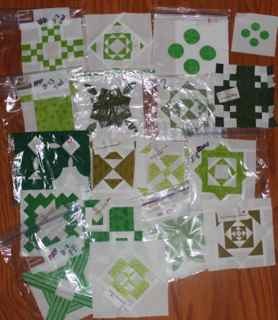 These days, by the time Sunday rolls around, I have a little stack of Dear Jane blocks in need of applique bits and pieces. 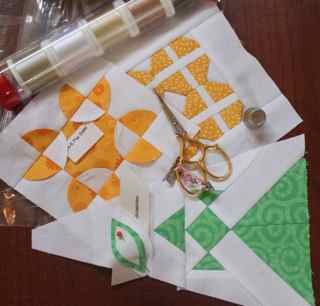 I got tired of triangles yesterday and started working on a few of the yellow blocks from near the center of the quilt. 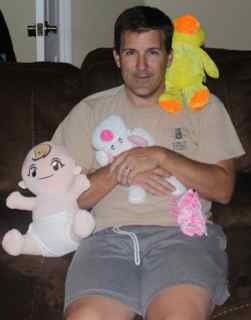 Mostly though, yesterday was a kid day. 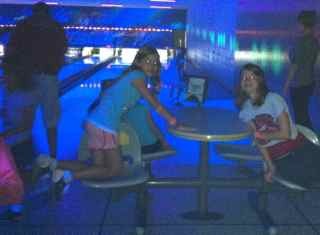 Sydney had a Girl Scout bowling party. Anna wanted to come along with us because Ryan was at a Paintball birthday party. 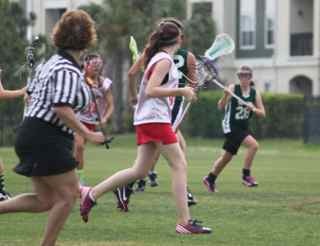 Anna's event was a Lacrosse game. Her team won! They don't do that much, so she was pretty excited. She stopped several balls from going into the goal and then got to spend time running around on defense. A little quiet stitching sounds like a nice way to spend today. I might need to carry it along to Ryan's football game, but the nice thing about applique blocks is that they are nicely portable. 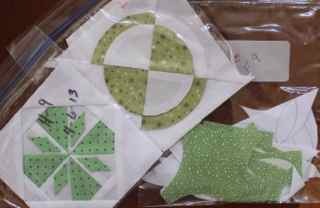 Head over to Kathy's blog to enjoy other people's slow handwork and slow stitching. 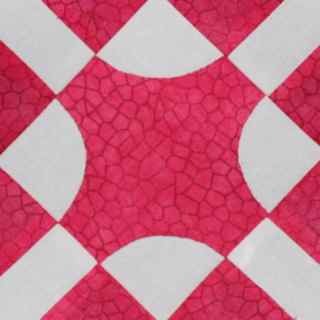 All the center blocks are done for my Dear Jane quilt, meaning I will make some triangles this weekend. I also have a good start on tiny nine patches from leftover subunits. I can't get over the range of shades of green. I keep thinking that there are lots of shades of green in nature and they all go together just fine. How are your greens going so far? Use the linky below to post your progress. 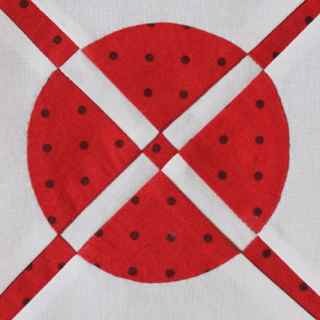 The round parts of G7 were appliquéd down to white triangles. 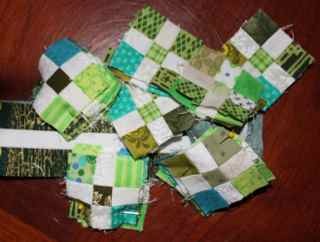 Then the little dividing strips were paper pieced and sew in between. The little dot in the center almost turned out right in the center. It is almost as if I planned it that way. I was on such a roll with green blocks today that I couldn't help finishing off the last one. There are still triangles of course, but the green center blocks are done! I've just got a bit of handwork saved up for the end. Two applique blocks and one which will be an attempt at hand piecing curves -- wish me luck on that one, curves are not my strong suit. So here is the wall again -- isn't it getting full? The closer it gets to being filled in the more I really want to just finish it all off. I'm not really thrilled with the distribution of green shades, there are two olives right next two each other offset by two limes on the other side. Maybe I'll fix it later but it might not look the same in the actual blocks. Anna went to a fair last night and won some stuffed animals. I'm not sure why, but she wanted to decorate dad this morning. We are just back from Ryan's football game, it is the start of a new season already and he is on a different team. Dad was lucky enough to get volunteered to be the coach this time. The good thing about being the coach is that he can coordinate the practice times so that they are at the same time as Anna's lacrosse. Maybe there will be less driving that way. Hopefully. I love the start of a new month. Something about putting away the last dregs of a color and pulling out a new bundle is a little like Christmas. 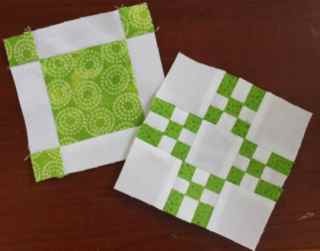 Even though the month has just started, I already have a few green blocks done. Looking at them, it is amazing how much range there is already. I see emerald and olive along with lime. 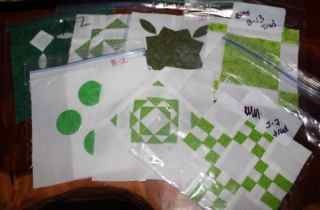 I almost wish I had divided green into light and dark for my quilt. Too late now though, maybe next time? How is your green month going so far? Use the linky below to share your plans and progress. We got the testing schedule for the rest of the year at a faculty meeting before school this morning. It made me thankful to have gotten through most of what I needed to teach before spring break. Between the grade level testing, the end of course testing and the AP testing, things will be busy between now and the end. It was a lab day after that though which is always fun for all. 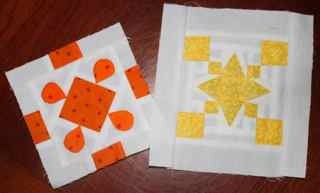 I was happy to have taken a little time to relax last night with the little applique bits on two more Dear Jane Blocks. I remember that the yellow block is called Pebble's Protest, but I have no recollection of the orange one. I'll look it up at some point so that I can get labelled and sorted away until the rest of the blocks are done. It has been a rainy day today, the kind that makes you want to snuggle up with a scrappy quilt and a good book. I am really enjoying seeing the progress of my Dear Jane blocks on the little design wall. 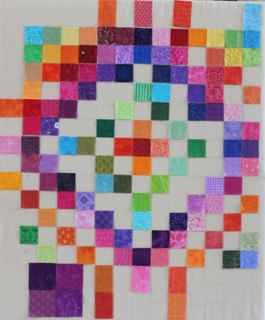 Each time I finish a block, it is so rewarding to cut out a little two inch square of fabric and nestle it into its spot on the quilt. Every so often I will pick a block that finishes off a row or a corner and brings one tiny portion of the quilt closer to completion. I have a printed chart that I am crossing off as well, but this version is so much more satisfying. It is that part of the school year for finishing things off as well. With just 7 weeks to go, the lists are all being checked twice to make sure everything is covered before the big end of course and advanced placement exams that will mark the end of the year. My very first triangle! 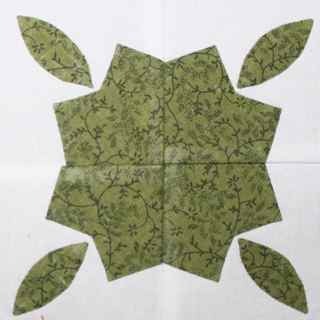 The triangles don't seem to have names, but this one looks like an oak leaf to me. It is #12 from the top. 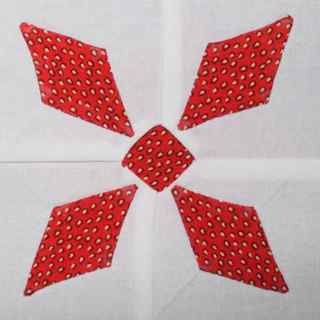 It was a simple applique block with 4 pieces. Feeling green? I am looking forward to the green grass of spring and hope to use up some green scraps at the same time. Green is usually a popular color for the scrap jar, so I am hoping to make a big dent. How about you? Lots of plans in the works? 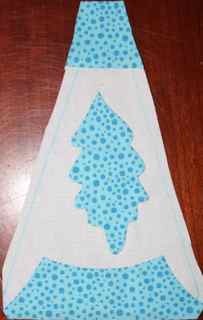 This one was appliquéd before the 1 inch borders were added at a later date. 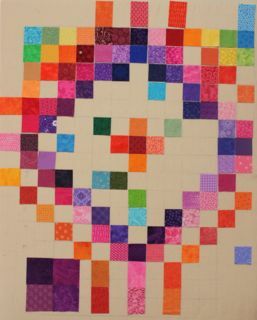 It is E2 and adds 12 pieces to the growing quilt.